JD POWER TOP RATED AWD SUV -- BACKUP CAMERA & PANO ROOF -- POWER LIFTGATE -- CLEAN CARFAX! JD POWER TOP RATED CROSSOVER AWD SUV -- BACKUP CAMERA & PANO ROOF -- POWER LIFTGATE -- CLEAN CARFAX! 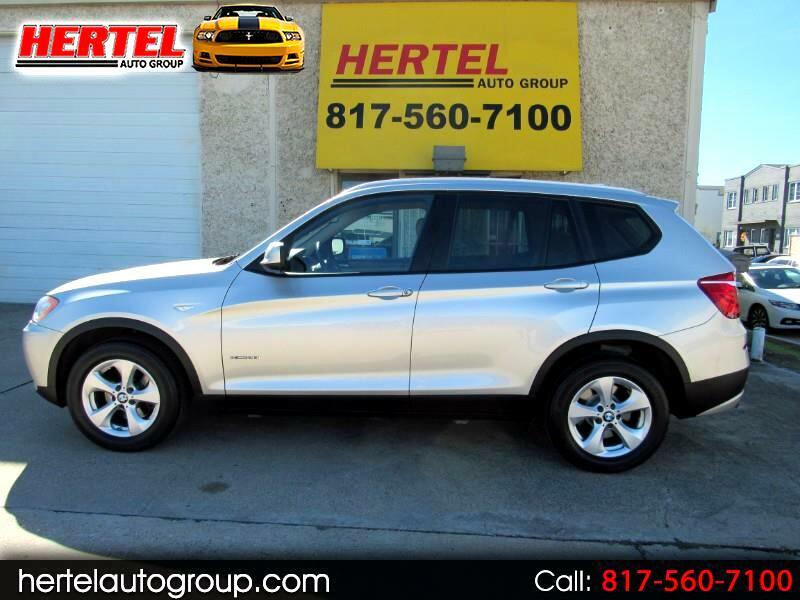 Hertel Auto Group is pleased to offer this beautiful, world-class 2011 BMW X3 2.8i All-Wheel-Drive Luxury SUV for sale in Fort Worth Texas. Bought brand new from Moritz BMW MINI of Arlington Texas in September of 2011 - and sold to its 2nd Owner as BMW Certified Pre-Owned (CPO) vehicle, this very nice and clean SUV has spent its entire life right here in Texas. If you've been looking for a safe and solid SUV for a new driver; one to use as a daily driver; or as an upgrade in style, luxury, amenities and technology for a growing family, this would make a great fit. You're also getting a quality SUV as well. So much so, that is was named J.D. Power's Best Premium Crossover SUV in 2011 with perfect 5.0 Scores in Performance, Comfort, Features and Style. This beautiful Bimmer beat out the Audi Q5, Mercedes Benz GLK Class; Volvo XC60; Acura RDX and the Infiniti EX Series to win this prestigious award. And while the previous gen X3 seemed more like a hastily engineered SUV rushed to market just to compete, the redesigned and refreshed 2011 model is a welcome evolution. Under the more dynamic looking sheet metal is a reworked suspension that provided a noticeably softer ride than the arguably bone-jarring ride of the 2010 and older X3 models. And for those who love the joy of a twisty curve and an inspired driving experience, there's nothing to fear. In true BMW tradition, the X3 is still plenty taut and inspired in corners, aided by all-wheel drive, but now provided a more compliant ride. Equipped with a 3.0-Liter DOHC 24V Inline 6-Cylinder engine, it had original factory specifications of 240 horsepower and 221 lb ft of torque with a good fuel economy rating of up to 25 mpg on the highway. Needless to say, this is not like driving your typical SUV as it behaves like a sports car on the road while offering the increased cargo and utility of a SUV or wagon. All four 245/55R17 tires mounted on OEM 17" alloy wheels are in good to very condition. Mechanically, it is ready to go with none of the dreaded "Triangle" Check Engine Lights current. Want even more peace-of-mind? We offer a fantastic 1-Year/Unlimited Mileage Extended Coverage that includes many of the most common items - including the A/C - for only $1,300; a 2-Year/30K Mileage Warranty for only $1,550 or a 3-Year/45K Mileage Warranty for only $2,000! Its rust-free exterior is finished in a beautiful Light Gold Paint Scheme that is complimented by a Tan interior. Inside, its smoke-free interior originally came equipped with a nice collection of amenities, including a Backup Camera; Front & Rear Parking Sensors; Power Liftgate; Panoramic Sunroof; Bluetooth; Front/Side-Body/Side-Head Airbags, ABS brakes, Auto On/Off Headlights, Park Assist, Traction Control, Auto Climate Control, A/C & Heat; Power Windows, Locks & Mirrors; Cruise Control; CD Audio; Keyless Entry and more. As with any pre-owned vehicle, it does have the usual amount of cosmetic imperfections that are inherent to a vehicle of this age and mileage. We invite you to view all of the photos that are available on our Web Site and determine for yourself if it meets your expectations for a vehicle of this age and price. If it does, we then welcome you to stop by for a viewing and test-drive of this great-looking 2011 BWM X3 2.8i Premium Luxury All-Wheel-Drive SUV. Based on its equipment, condition, ownership history and mileage, we've priced it very fairly in the marketplace and expect it to sell quickly. Don't let this great deal pass you by! Message: Thought you might be interested in this 2011 BMW X3.